“The Words of the Year 2010” ceremony was held last week in Tokyo. The words represent what are popular now in Japan. The word received the grand award was “GeGeGe no-.” It came from a title of a popular TV drama “GeGeGe no Nyobo” broadcasted by NHK. 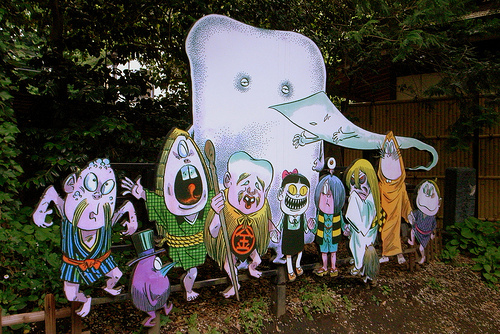 It is based on the autobiography written by a Japanese famous manga writer, Shigeru Mizuki’s wife, who supported him since he was a nameless poor manga writer. Following list is other words received the award. Iku-men (Child Rearing Men): “Iku” is short for the Japanese word “ikuji,” which means child rearing. Recently Japanese father who take paternity leave are gradually increasing. “Iku-men” refers the fathers who try to get involved in parenting. AKB48: Japanese girls group consists of 48 members. Read the past article “AKB48 -Mega Japanese Idol Group of 48 Girls” to learn more. Taberu ra-yu (Chili Oil to Eat): Japan has been in chunky chili oil boom. Use it for cooking or eat it with rice… people enjoy chili-oil in various ways. -nau (now): “Nau” is Japanese sound for “now” in English. Twitter users used it to tweet what they are doing. For example, when you want to say “I am eating sushi now,” you can simply say “Sushi nau (now).” Once people got used to using it, they use “nau” everywhere, even in other chat rooms or blogs.